Shot in Los Angeles between February 24 and May 3, 2004, the film debuted at the 2005 Cannes Film Festival on May 14, 2005  and was released in the United States on October 21, 2005. It received positive reviews from critics and grossed $15 million worldwide. 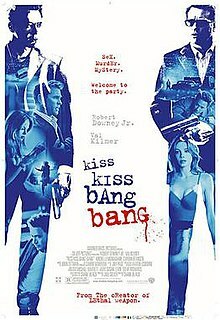 Kiss Kiss Bang Bang was screened out of competition at the 2005 Cannes Film Festival. The film's premiere happened at the Chinese Theatre on October 17, as the opener of the Hollywood Film Festival. Kiss Kiss Bang Bang was released on DVD June 13, 2006. Mike Russell of The Oregonian observed that "This is one of Downey's most enjoyable performances, and one of Kilmer's funniest. It's a relationship comedy wrapped in sharp talk and gunplay, a triumphant comeback for Black, and one of the year's best movies". Jeff Otto, an IGN critic, wrote that "It takes a bunch of genres and twists them into a blender, a pop relic that still feels current...one of the best times I've had at the movies this year." It was voted "Overlooked Film of the Year" by the 2005 Phoenix Film Critics Society on December 20, 2005.